The Nadz was a group formed by Scott Hansen. 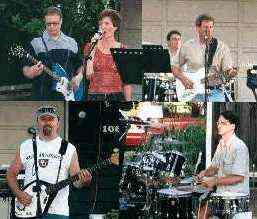 They played around the Puget Sound, during the summer of 2002 in Seattle, performing mainly at private parties, block parties as well as the 2002 General Motor Cup Hydro Races on Lake Washington (where they were told they had to turn down because they couldn’t hear the racing announcers). On October 5th 2002, The Nadz went in to Electro-Kitty Studios, in Seattle, and recorded their album “Peach Fuzz”. Gary Hoskins – Has also played in other NW Bands 100 Proof, The Backbeats, The Blenders, Slightly Smashed Pumpkins, and The Unknowns. Some of the other Pacific Northwest music groups represented in this band include: 100 Proof, The Backbeats, The Blenders, Slightly Smashed Pumpkins, The Unknowns, and many other NW bands.